Labels: Select the column header that contains labels for each row. These labels are in your category-column. We'll choose the column "Education" for our labels. Groups: You can upload an extra column to put categories into groups. In our case, we could have a column that indicates if our education levels are below high school or above high school level. Each row in this column would have either the text "below high school" or "above high school". If we chose this column as our "Groups", the chart would make a separation between these two levels. Range start: Select one of your numeric columns. In our case, we choose the column "Women". Range end: Select the other numeric column. We choose the column "Men". Hint: It doesn't really matter which one of your numeric columns you choose for the Range start and which one you choose for the Range end. The chart doesn't look different. However, you will need to remember which column you chose for which to select your colors a bit later. The order of our rows: How should the lines and labels be sorted? You can keep the order of your spreadsheet, or you can sort the lines by the values of the range start (the column "Women", in our case), by end date ("Men"), by the difference between the start and end date or by the percentage point change between the start and the end date. 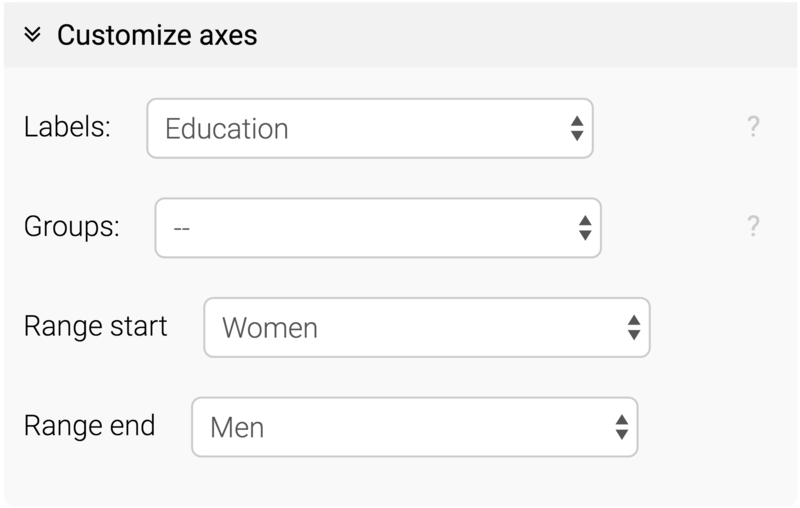 The extent of your x-axis: Datawrapper chooses the extent of your x-axis based on the minimum and maximum value of your whole data. If you like to change the default extent, you can do that here. Opposite to bar charts, you can have a minimum value that's greater than zero. 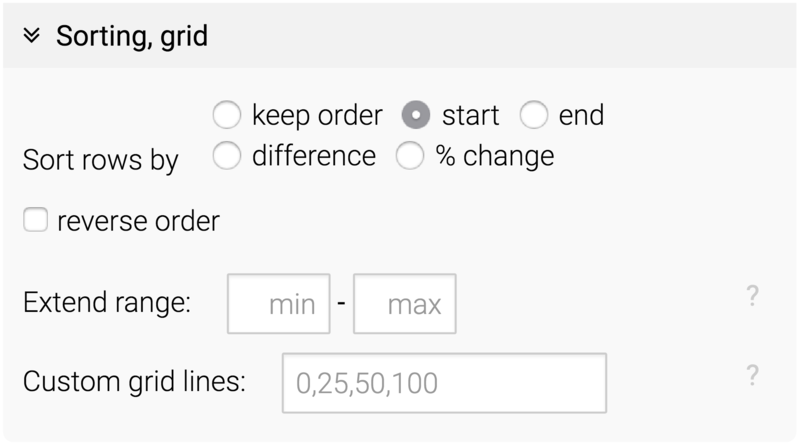 If you want different grid lines: Your charts will have grid lines without touching that option – but if you want to change the default, you can do that here. Type in the numbers on which you want to see gridlines. E.g., typing in the two numbers "0, 20" will result in two gridlines on the entire x-axis: One at zero, the other one at 20. In this panel, we can also decide if our chart should have a color key or not. This will create a tiny legend above the two dots of the top line in our chart. To explain to our readers what the dots mean, we choose to turn on the color key. Numer format: Our values might be percentages and we want to add a percentage sign, or our values are very high numbers (e.g. 3844929) and we want to shorten them (e.g. to 3.8m). With this option, we can make our data more readable. Label values: Here we can decide if you want values to be displayed next to the dots, and which ones you want to display. You can choose to display the values from your columns with "start", "end" or "both". Our Datawrapper can calculate the difference or the change in percentage point between the two values on each line.